The ‘budget supermarkets’ – Aldi and Lidl specifically – have contributed to a time of transformation for the sector as consumers embrace the German retailers’ ‘low price but high quality’ message. Of course, all supermarkets have ramped up their advertising efforts in time for the Christmas season. Lidl’s effort displays the confidence and assuredness that they can challenge some of the traditional big brands not just on price, but on quality too. This relates to the crucial aspect of the changing nature of the sector. Consumers believe that they can get the same level of quality at stores such as Lidl that they previously have done at one of the larger stores. The premise of the advert is linked to the tagline ‘Lidl Surprises’. Guests at a Hertfordshire home enjoy a festive feast, commenting on the great quality and taste before trying to guess which retailer supplied the ingredients. Answers include M&S and Waitrose before discovering they are in fact from Lidl. It underlines the consistent key message Lidl pushes, choosing not to employ an emotive campaign as other large retailers have. YouGov BrandIndex data can help us understand how successful Lidl’s Christmas campaign has been since its launch. Our Ad Awareness metric measures the percentage of people that have seen an advert in the last two weeks. Since the beginning of September we can see the Lidl’s score has risen significantly from 16.2 to 35.8, highlighting its cut-through with the public. 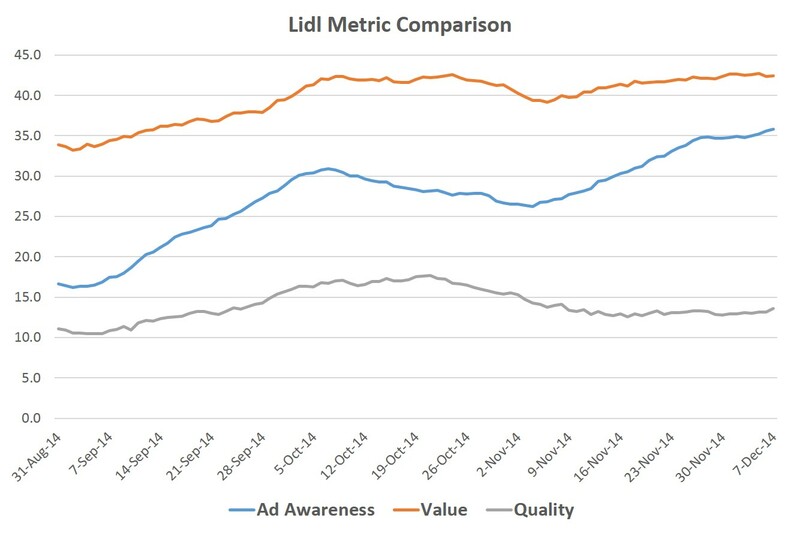 We also see Lidl’s value metric continue to rise, from 33.2 to 42.4 over the same time period. The quality metric, although showing a small lull recently, remains solid and resolutely positive. YouGov Profiler helps us to analyse what differentiates customers of Lidl from their comparison set. It mirrors the theory of their consumer base being interested in quality as well as a good deal. In the personality subcategory, Lidl customers describe themselves as ‘Always on the lookout for special offers’, while also saying ‘I consider myself to be a healthy eater’. The challenge of course, is to maintain this momentum in the years ahead. As Britons begin to feel the recovery in their pockets, will their new found interest in the budget retailers last or will they move back to the other larger supermarkets? It wants to compete on that basis to expand on its loyal customer base, and be able to challenge those renowned for high standard products, not just be a ‘recessionary blip’.